If you already know your FMI Fireplace model number, we've created a simple way to navigate to the perfect replacement fireplace doors for your particular application! Click on your model number from the table below (complete with width and height measurements for verification), and we'll take you to our collection of high quality fireplace doors that are guaranteed to fit your FMI Fireplace! Please double check measurements, as we do not guarantee the accuracy of our table above. 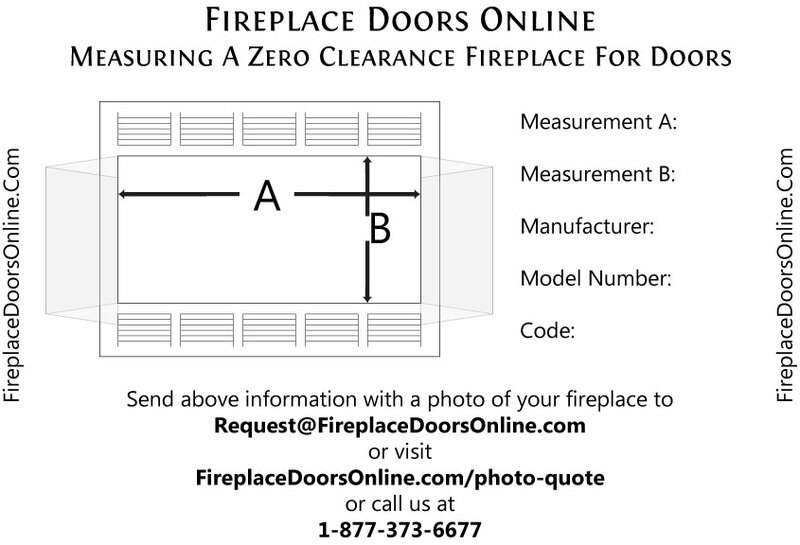 Click Here to learn how to measure for your new fireplace doors! Watch a Video on how to measure for your new fireplace doors! <Print this diagram showing exactly what measurements you'll need! If you're still unsure, we can help you! Give us a call at 1-877-373-6677 and one of our fireplace door experts will gladly assist you in finding replacements doors that will fit your fireplace, decor, and budget! OEM fireplace doors must be shipped in special packaging and do not qualify for our free shipping promo. The majority of our customers, when shopping for new fireplace doors, are interested in the entire replacement door. This includes the glass panels, rails, tracks, main frame, and mounting hardware (if applicable). Often times their existing main frame and components may be damaged or outdated. In this case, it is more desirable for customers to outfit their fireplace with a complete glass door enclosure. Due to the change in styles and trends, many manufacturers no longer use the same finishes that they did years ago. (In fact, some manufacturers change their finish colors annually!) This creates a problem when customers are looking to get OEM doors that will have the same door frame color as their existing main frame. Because of this reason, we offer complete fireplace enclosures with matching door and main frame finishes.